CINCINNATI designs its equipment to comply with OSHA/ANSI safety standards for machine construction. The Company also emphasizes safe practices in the instruction which is given to machine operators and maintenance personnel (see Customer Training section). CINCINNATI publishes a variety of safety-related manuals and pamphlets which are available in reasonable quantities free of charge. Finally, the Company regularly advises owners of our equipment when new safety equipment is available or when design modifications are recommended provided, of course, that we have the owner's name on file. If you have purchased a piece of CINCINNATI equipment from a dealer of used machinery, your name might not be in our customer files. In such instances, we suggest you call or write the Product Safety Department, giving the serial number of your machine. We will respond with up-to-date safety advice. Press Brake Safety Packet: includes the above material, a set of safety signs, two-hand operator control information, safety guidelines and complete information on available Safety Update Kits. 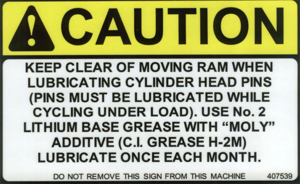 Specify English, French or Spanish signs and whether your machine is Mechanical or Hydraulic. Basic Press Brake Operator Fundamentals: is an Audio/Visual Training program available at nominal cost for everyone working on or around press brakes. Safety Manuals: for either Mechanical or Hydraulic machines. Shear Safety Packet: includes the safety manual, a set of safety signs, safety guidelines and complete information on available Safety Update Kits. Specify English, French or Spanish signs and whether your machine is Mechanical or Hydraulic. Basic Squaring Shear Operator Fundamentals: is an Audio/Visual Training program available at nominal cost for everyone working on or around squaring shears. P/M Press Safety Packet: includes ANSI B11.16 safety standard, safety manual, safety guidelines and a set of safety signs. Laser Center Safety Packet: includes safety manual, safety guidelines and a set of safety signs. OBS Press Center Safety Packet: includes safety manual, safety guidelines and a set of safety signs. For any of the listed materials please print the safety bulletin and fax back the completed second page to 513-367-7552.